This is not your regular cache, you will have invested thousands of miles to get the answer to this one! Do not go looking at the cache coordinates listed, the Kansas Highway Patrol will give you a Christmas Coupon! Delorme Maps are available at a lot of truck stops and travel plazas. I buy mine at a discount store. You do not have to buy a Delorme Map to complete this cache, but it will help you. Basically the maps divide the state up into sections. 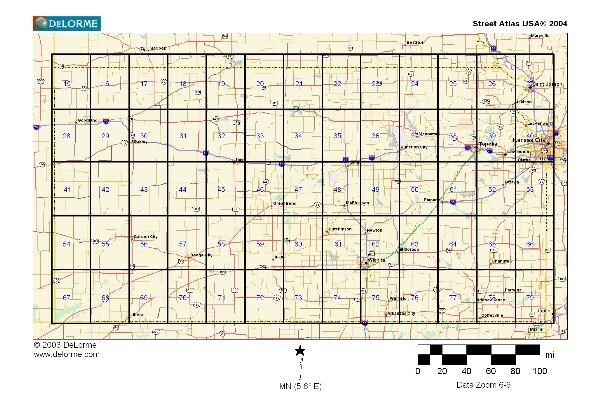 Kansas is divided into columns and rows, five high, thirteen wide for a total of 65 sections. The maps are an excellent source of information and are even broken into a GPS grid. In order to claim this cache you will have find a cache in each section on the Delorme Maps. There it is, 65 caches, one cache in each block on the grid. I have checked and there is a cache to be found in every block. In fact I think I only need about five blocks to complete this cache myself. I have been doing some more research and have to add that caches you have hidden do count as a find for you. Otherwise there are a couple of cachers in the state that would have to wait for another cacher to place a cache in certain blocks of the state. When I drove around the state photographing the courthouses, I estimated that it took over 6000 miles to complete the tour. I think at the very least you will have driven 5000 miles to qualify for this cache. The final coordinates will be sent to a qualifying cacher upon their submission of a completion notice by placing a note on the cache page. 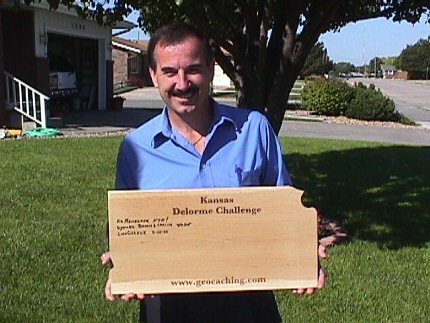 The KSRenegade scored his FTF on the Kansas Delorme Challenge. We stood around and reflected over the adventure and shared notes. I will be looking forward to the next one that completes the challenge! 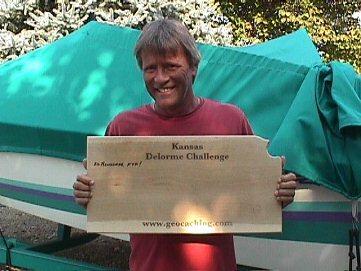 byonke, Brian and Carlin, came to Kansas to finish off the Kansas Delorme Challenge. They spent a few days touring the western half of the state, knocking down a tremendous section of Kansas in just a few days. Again, it was really nice to speak with them and exchange a few notes about their adventures. 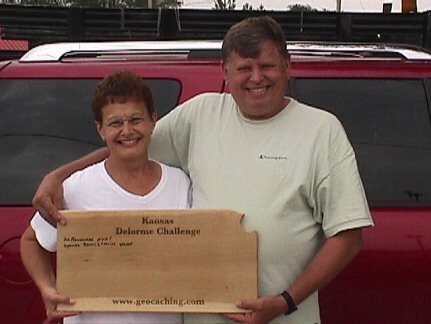 LuvGeezuz, Ken and Connie knocked down the Kansas Challenge from Hays. I knew Ken was getting serious when the questions started rolling in about questionable caches. I would like to thank him for placing and repairing caches in several blocks. 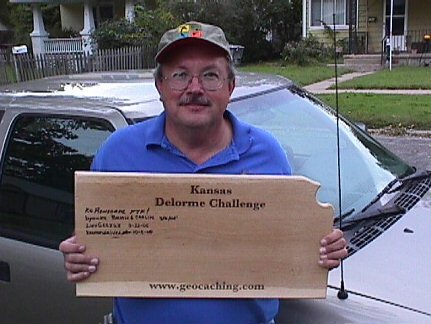 The Delorme Challenge has been a KS cacher's cooperative and I apprecate all those who chipped in to make it work. 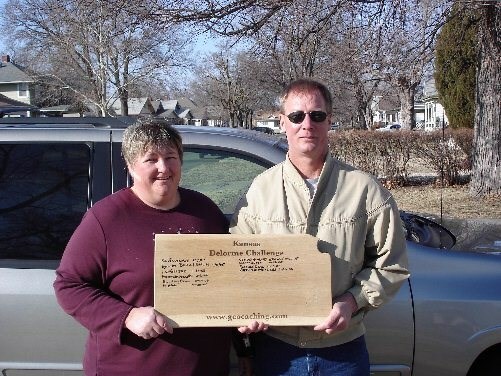 BarondriverThe barondriver completed the Delorme Challenge on October 2, 2005! FTF for an out of state cacher....Brian and Carlin came to Kansas on vacation and toured the vast open range of western Kansas. They stopped by Salina to claim their prize, it was really nice to talk with them about their adventures. Super Job! KsPrairiePartnersThis one came as a surprise, they sent me an e-mail about two days before completion and said they planned to complete it at the end of the week. Great job! Another nice geocaching experience, it was a pleasure meeting them. LuvGeezuzKen and Connie completed the Challenge, what a team!